This reading group guide for You’re Never Weird on the Internet (Almost) includes an introduction, discussion questions, and ideas for enhancing your book club. The suggested questions are intended to help your reading group find new and interesting angles and topics for your discussion. We hope that these ideas will enrich your conversation and increase your enjoyment of the book. 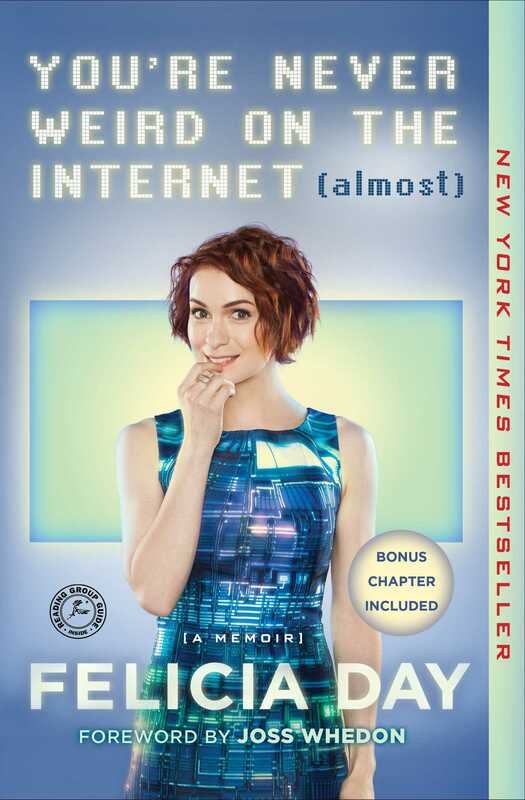 The instant New York Times bestseller from the “queen of the geek girls” (George R. R. Martin), You’re Never Weird on the Internet (Almost) is web entertainment pioneer and actress Felicia Day’s memoir about her unusual upbringing: how she overcame anxiety, depression, and a gaming addiction and became phenomenally successful online by embracing her own weirdness. 1. Joss Whedon’s Foreword says that we live in a culture that makes it hard to be weird, and there are many moments in Felicia’s memoir that portray the difficulty she’s had finding a place to belong. What are some of your own most notable moments of not fitting in because of your passions? 2. How does homeschooling help Felicia’s development as a child and how does it hinder her? Do you think being homeschooled can be more valuable than attending a traditional school? 3. Felicia begins chapter two with a particularly good coffee mug slogan: “Knowing yourself is life’s eternal homework.” How do her various passions in her teenage years (culminating in her discovery of the internet and the Ultima Dragons) come together and contribute to her sense of identity? 4. Felicia’s takeaway from her days as a college overachiever is that striving for something is only worth it if you have the right motivation. What are your own right reasons for doing your best? Think outside the box here, and share with your book club. 5. Check out the beginning of the “Let’s Try That Whole ‘Writing’ Thing Again” section on page 129. For someone as busy as Felicia is, she finds a lot of value in being bored. Do you agree that boredom can be productive? Why or why not? 6. Felicia is candid about her struggles with writer’s block, a full-blown gaming addiction, and severe anxiety and depression—and how she reinvented herself when overachieving became overwhelming. How does the pursuit of perfection drive her achievements? Do you think perfectionism is necessary for high achievement? 7. Felicia admits that the pressures of success can sometimes be more difficult to manage than failure. Do you agree? 8. How do you overcome negative or self-defeating thoughts in your own creative life? 9. Felicia isn’t just talking about World of Warcraft when she says that “crusades are part of my DNA.” Do you think she would have been as successful without having to fight for her dreams? Does being underestimated play into her success? 10. For Felicia, there is a fine line between happy obsession and anxiety. Do you think worry is a necessary part of a creative life? Why or why not? 11. A homemade aesthetic is key to Felicia’s projects, from her self-devised homeschool curriculum to her set design for season one of The Guild to her superpopular YouTube projects. Were you surprised by this commitment to old-fashioned DIY, since she’s known as such a tech-savvy internet personality? Why or why not? 12. Fan conventions like San Diego Comic-Con are a big part of Felicia’s life and work. What role do you think they played in the development of her career? Why do you think Cons have become so popular in recent years? Have you ever been to one? 13. Representation is a big buzzword in discussions of gaming culture, as leaders like Felicia work to make the internet a safer and more creative place for people from all walks of life. Whether your thing is crocheting or coding, how do you and your book club members work to make your passions more inclusive? 14. “‘I am determined to create something or express myself, no matter how hard it is, even if my mom is the only one who sees it!’ is the embodiment of how I view the web.” How do you view the web, and what does it mean to you? Come up with a motto of your own and share it with your book club. 1. 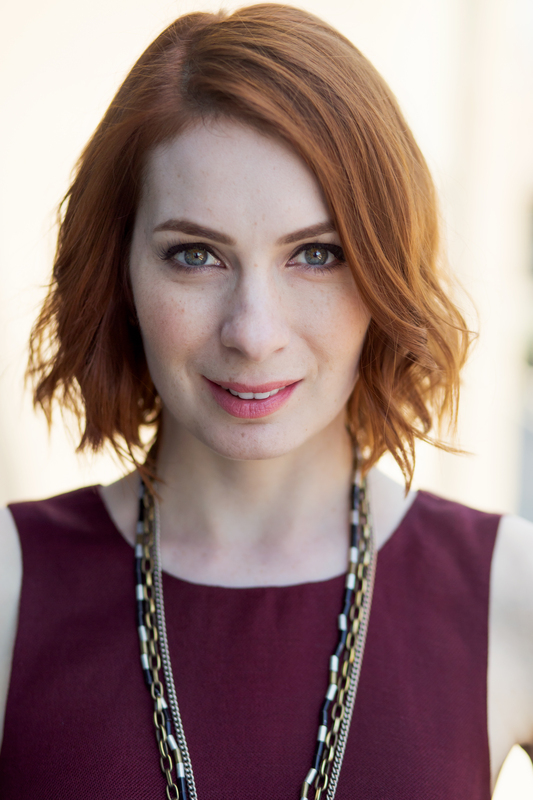 Along with cohosts Veronica Belmont, Bonnie Burton, and Kiala Kazebee, Felicia is a founder of the ultimate fan book club, Vaginal Fantasy (she’s also one of the most followed people on Goodreads—period). Get to know her taste in fiction and read along with her by doubling up on your picks for your book club meeting. Select a novel she’s reviewed recently to read with your club. Bonus points if you can schedule your meeting to coincide with one of her Google Hangouts on youtube.com/vaginalfantasy on the last Tuesday of every month. More information can be found at goodreads.com/vaginalfantasy. 2. Felicia almost gets kicked out of ballet class for her obsession with astrology. Honor the fortune-teller inside by researching horoscopes for all of your book club members. 3. Get your book club online and leave a group video review of You’re Never Weird on the Internet (Almost). Be sure to tag Touchstone Books and Felicia! 4. Start your own creative support group like Chick-In.